We'll see how much reading I get in these next few days. I'm helping man work's exhibitor's booth at Mountain & Plains this weekend. Should be super fun and interesting -- my first official trade show. I'm interested to see if the ABA folks will be talking about next year's World Book Night efforts. Anywho. Tomorrow's October 1! You know what that means? I'll be amping up the horror reads (because they all seem to come out right about now). I kick started it this week with The Exorcist, which I am happy to say that either age or reading rather than watching made much more appealing than my first go around with the flick. I also dove into The Monster's Corner, which reminded me just how much I've come to love short stories. Anthologies like this give you a taste of so many different authors and styles. You may love some, you may hate some, and you may say, "Hey. I haven't read him/her before and now I want more!" The contributors in this one surprised me a bit. Sharyn McCrumb, whose Ballad series is in my TBR list, Dana Stabenow, and Chelsea Cain (who writes about monsters anyway, so I'm not sure why I was surprised) are all well known mystery/suspense authors I didn't expect to see is a horror anthology. I should mention that while Monster's Corner features "monsters" exclusively, Golden points out that there are no zombies in this book. Instead, Liss's story features an unexpected teen creature that made for a fun and twisted tale. Lauren Groff's fairy tale-like dystopian set story, "Rue," was another of my favorites here. I admit that I was super excited to see Sarah Pinborough as a contributor -- I love her work and have two of her books in my TBR right now. David Moody and Michael Marshall Smith are two more authors I've read that I was pleased to see took part. Tom Piccirilli -- Golden and Piccirilli both contributed to a novella collection called Four Dark Nights, which I read AGES ago. I gave myself a week. One week. I made myself wait seven days to read the sequel to The Demon Trapper's Daughter and it was hard. I LOVED Demon Trapper's Daughter and every book I read after that, I was pretty much consumed by getting back to the series. I know. Now I have to wait until next spring to find out what happens next! Soul Thief picks up right where Demon Trapper leaves off (beware of spoilers if you haven't read Demon Trapper yet). Riley made a deal with heaven to save her boyfriend who is now on the way to recovery, but not quite himself. And now, Riley has to find out who raised her father. With the help of Mort, a necro with morals, she's on a mission to track down the illegal summoner and free her father. Meanwhile, the Vatican is none too happy with the events at The Tabernacle. The demon hunters have made it their mission to clean up Atlanta and they don't care which trappers they step on in the process. Some big stuff happens in this one and I can't tell you or I'd ruin the surprise :) We wouldn't want that, would we? I can tell that I'll be first in line to buy the new installment when it's released. Agh! Riley is one of my favorite new characters. She's stubborn and smart, and of course there's something more to her that we've yet to learn. I also love Beck. And Mort. And the little klepto demon! In fact, all the little details that Oliver has thrown in here are fantastic. The depth of the setting is amazing and another big draw for me with this series. It's easy to forget that this is a teen read while in the midst of the story. Saying that, and not being a parent, I'd assume the audience is on the older teen range given that Riley is 17 herself. All I know is that it reads fine from this adult's perspective! One Down in the TBR Tackle! So The Peach Keeper, or let's back up a sec and look at The Girl Who Chased the Moon, which was my official introduction to this author (though Garden Spells was on my radar for a while). The Girl Who Chased the Moon was such a sweet read. Just an overall pleasure to dive into and one that set the bar high as far as my expectations in reading other books by this author. Not surprisingly, The Peach Keeper delivered on all counts and may even have surpassed Girl. In The Peach Keeper, thirty-year-old Willa Jackson has settled into life in Walls of Water, North Carolina. She's the last in what was once a rich and well-respected family that brought industry and prosperity to their little town. All that changed in the 1930s when the family lost their home and Willa's pregnant (but single) grandmother was no longer the talk of the town in any way that folks desire. Willa made a name for herself as a prankster in high school, but fled the town in search of something new, only returning after her father's death. When Paxton Osgood sends Willa an invite to the unveiling of the newly restored Blue Ridge Madam (the Jackson family manse), Willa is definitely not planning to attend. But when the big peach tree out front is removed and a body is found, Willa and Paxton come together to uncover a secret that's been hidden for over seventy years. A peachy keen southern read that's as delicious as the title implies! Sarah Addison Allen's particular style and use of magical realism make her books truly delightful and appealing to readers across the board. Whether you like the warm, sunny feel of a good southern read, a little element of mystery, fairy tales, or romance, The Peach Keeper has all that and more. It's another anniversary. This time, it's the 40th anniversary of William Peter Blatty's The Exorcist and HarperCollins has released a special hardcover edition to commemorate the special occasion. Originally published in 1971, The Exorcist, one of the most controversial novels ever written, went on to become a literary phenomenon: It spent fifty-seven weeks on the New York Times bestseller list, seventeen consecutively at number one. Inspired by a true story of a child’s demonic possession in the 1940s, William Peter Blatty created an iconic novel that focuses on Regan, the eleven-year-old daughter of a movie actress residing in Washington, D.C. A small group of overwhelmed yet determined individuals must rescue Regan from her unspeakable fate, and the drama that ensues is gripping and unfailingly terrifying. Two years after its publication, The Exorcist was, of course, turned into a wildly popular motion picture, garnering ten Academy Award nominations. On opening day of the film, lines of the novel’s fans stretched around city blocks. In Chicago, frustrated moviegoers used a battering ram to gain entry through the double side doors of a theater. In Kansas City, police used tear gas to disperse an impatient crowd who tried to force their way into a cinema. The three major television networks carried footage of these events; CBS’s Walter Cronkite devoted almost ten minutes to the story. The Exorcist was, and is, more than just a novel and a film: it is a true landmark. Purposefully raw and profane, The Exorcist still has the extraordinary ability to disturb readers and cause them to forget that it is “just a story.” Published here in this beautiful fortieth anniversary edition, it remains an unforgettable reading experience and will continue to shock and frighten a new generation of readers. I was in college before I actually saw the movie and I really wasn't a big fan. I know, I know. It's horror movie fan blasphemy to say such a thing. One of the things that drove me absolutely bonkers was the fact that there was no explanation where I wanted one. But, I also heartily admit that coming to a book or movie at the wrong time can deeply affect how you walk away from it. I saw Gone With the Wind as a teenager and hated it. The open ending drove me bananas. So here I am, reading the anniversary edition of Blatty's The Exorcist and I plan to rewatch the film after. We'll see if my tastes have changed. I will say this, though, even if I disliked the movie, there's just as much of a chance I'll actually like the book. I made it past the hundred page hurdle last night without any real issue. And the action's just beginning to happen. The Exorcist 40th Anniversary edition is due out October 4, just in time for Halloween horror reading! I love to see what authors are reading and am very prone to picking up their recs on a regular basis. Course, I pick up recs from all over the place, but there are some authors out there who definitely share my taste in books and have turned me on to things I would have probably missed otherwise. I have to thank Doug Clegg for this one, it was his mention that popped up on facebook and caught my attention. Cemetery Girl by David Bell is due out officially on October 4. Tom and Abby Stuart had everything: a perfect marriage, successful careers, and a beautiful twelve-year-old daughter, Caitlin. Then one day Caitlin vanished without a trace. For a while they grasped at every false hope and followed every empty lead, but the tragedy ended up changing their lives, overwhelming them with guilt and dread, and shattering their marriage. Four years later, Caitlin is found alive—dirty and disheveled yet preternaturally calm. She won’t discuss where she was or what happened. Then the police arrest a suspect connected to the disappearance, but Caitlin refuses to testify, leaving the Stuarts with a choice: Let the man who may be responsible for destroying their lives walk away, or take matters into their own hands. And when Tom decides to try to uncover the truth for himself, he finds that nothing that has happened yet can prepare him for what he is about to discover. And this one comes with blurbs from the likes of Lisa Unger, Will Lavender, and Jonathan Maberry, amongst others. I have to say, I can't wait to dive into this one! I snagged a copy for review and will keep you posted. As an aside, Bell is hosting a really awesome giveaway on his site: a free ereader to one winner each week and all you have to do is preorder the book. Dets on his site, but if you decide to take my rec for it, preorder and maybe you'll win! WAY back in June, I mentioned I was going to be making an effort to whittle down the TBR stacks a bit. My first idea was to take on a sort of alphabetical challenge and I had made some A-G picks to start off. I did get to two of my As but then started reading out of order. Ha. It's back on. I've made some adjustments to suit my current reading mood and will be injecting TBR reads throughout the review schedule (yes, I keep a review calendar with release dates and read by dates). I've also promised (after three Borders closeout trips) that I will not buy any more books until the new Stephen King comes out in November (and have succeeded even though I did preorder said Stephen King along with the fourth Iron Fey book). And I haven't been posting as regularly as I should, so there are actually a few more that got knocked out and haven't been featured on the blog. To date, in 2011, I've read a total of 112 books. 42 of those were from June forward (most were new). There's no doubt they'll all get read at some point. There's also no doubt that I'll be reading other things from the TBR stack as well as the new review books along with these. I'll probably be on a big horror kick in the next month as well. These just happen to be the ones I've put on my official Shelfari Planning to Read shelf and I've noticed that that classification sometimes becomes the kiss of death for my older books. Not this time! Holy moly! I spent my Saturday with Riley Blackthorne, heroine of The Demon Trapper's Daughter, the first book in Jana Oliver's Demon Trappers series. It was fantastic! I really loved this book! Riley Blackthorne is an apprentice demon trapper. Her father, Paul Blackthorne, is well-known in the industry and Riley plans to follow in his footsteps. But when Paul is killed while trying to trap a Three, Riley finds herself suddenly alone and fending for herself. First thing she has to do is protect her father's body from the necros. Second is figure out how she's going to pay the rent. Third is how she's going to survive. I was hooked on the very first page! 2018: Atlanta, Georgia. Really? A near-future teen read with demons? That's enough of a premise to spark my curiosity. And it only gets better. In the opening chapter, Riley, a stubborn seventeen year old, chases down a Biblio-fiend and wrecks a library. This book totally comes together in an incredible way. Everything -- from the setting and characters, to the plot and the writing -- everything worked for me! And one of my biggest likes is that Oliver doesn't talk down to her audience. There's nothing overly kiddy about Riley or about the writing, something I think some authors struggle with in writing teen fiction. It seems to have come to Oliver naturally. I can't wait to read the second in this series. In fact, I was tempted to begin Soul Thief immediately after finishing The Demon Trapper's Daughter. I think I'll save it for next weekend, but it's going to be hard to wait! Morning, readers. Happy Monday to you (though it's Sunday as I write this). Just got back from seeing Contagion and thought it was a worthy pic. Mike said it's just Outbreak, and while there are certainly similarities in plot, I still enjoyed it. As we speak, I'm reading in 19th century Edinburgh courtesy of author Brian Ruckley, the author of the Godless World trilogy (Winterbirth, Bloodheir, and Fall of Thrones). His latest, The Edinburgh Dead is a cross-genre historical that caught my eye as an upcoming release earlier this year. Edinburgh 1828: it’s a city populated by mad alchemists who treat Frankenstein as textbook rather than novel and by a criminal underclass prepared to treat with the darkest of powers. And one officer, from the recently formed Edinburgh City Police, must follow the trail of undead hounds, emptied graves, brutal murders and mob violence into the deepest and darkest corners of Edinburgh’s underworld – both literal and magical – and back again to the highest reaches of elegant, intellectual Edinburgh society. The Edinburgh Dead was released last month (trade paperback). I might ask you, what could possibly be better than a gothic historical mystery set in 1828 Scotland? It's intriguing, to be sure and now that I've had a chance to dive in, I can tell you that the book delivers. One of the things I love about historicals (and by this, I mean any book with a historical setting) is the effort a good author makes in accuracy on all levels. Sure, this is a book about zombie dogs and graverobbers and crazy experiments, but it's all set in 1828 and Ruckley seems to have paid all the appropriate attention to detail here, making it so easy to be transported by the story. I'm enjoying it quite a bit and am about halfway through at the moment. Oh, btw, if you happen to be taking public transportation soon, take along The Edinburgh Dead. Ruckley mentioned his recent observations of folks reading (and not reading) on trains and I'm sure the thought of some American reading one of his books in transit would be good news. I don't have a train to offer, but I do have my back porch and patio chairs. Next week is Cherie Priest week! The fourth book in her Clockwork Century series is coming out on 9/27, which means I need to get to book three! Yikes, how easy it is to fall behind. I've read Boneshaker and Clementine, and Dreadnought is patiently waiting. This is a good reading weekend, though, so I might just have a chance to get to it if I'm lucky (or I can read it next week). The air pirate Andan Cly is going straight. Well, straighter. Although he’s happy to run alcohol guns wherever the money’s good, he doesn’t think the world needs more sap, or its increasingly ugly side-effects. But becoming legit is easier said than done, and Cly’s first legal gig—a supply run for the Seattle Underground—will be paid for by sap money. New Orleans is not Cly’s first pick for a shopping run. He loved the Big Easy once, back when he also loved a beautiful mixed-race prostitute named Josephine Early—but that was a decade ago, and he hasn’t looked back since. Jo’s still thinking about him, though, or so he learns when he gets a telegram about a peculiar piloting job. It’s a chance to complete two lucrative jobs at once, one he can’t refuse. He sends his old paramour a note and heads for New Orleans, with no idea of what he’s in for—or what she wants him to fly. But he won’t be flying. Not exactly. Hidden at the bottom of Lake Pontchartrain lurks an astonishing war machine, an immense submersible called the Ganymede. This prototype could end the war, if only anyone had the faintest idea of how to operate it…. If only they could sneak it past the Southern forces at the mouth of the Mississippi River… If only it hadn’t killed most of the men who’d ever set foot inside it. But it’s those “if onlys” that will decide whether Cly and his crew will end up in the history books, or at the bottom of the ocean. And if you live in the Denver-ish area, Cherie is going to be in town doing a signing at the Broadway Book Mall on November 16. I'm super excited! These folks hosted Mark Henry for his local signing and they do a ton of local author events as well. Can you cook for a living and have fun? Lauren Shockey says... meh, probably not. At least that's what I took from Shockey's recently released food memoir, Four Kitchens: My Life Behind the Burner in New York, Hanoi, Tel Aviv, and Paris. When Shockey begins her tale, she's graduated from college and reveals to her parents that she wants to pursue a culinary degree. After finishing culinary school, she decides to basically cook her way around the world -- and the industry -- by being a stage (cooking intern, basically) at four very different restaurants in four very different locales. She begins at Wylie Dufresne's wd-50 in New York where she details life in the molecular gastronomy kitchen. From there, she moves to Hanoi in Vietnam to work for Didier Corlou's La Verticale. In Vietnam, she learns much more than tedious kitchen work. Her eyes are opened to another culture and new flavors. Her third stage is in Tel-Aviv where she works for Carmella Bistro. We see less of her kitchen experience here -- less of the restaurant kitchen, anyway. She does spend time cooking with friends throughout this section of the book, leading one to suspect exactly what she's learning from this whole experience. Once in Paris, working at Senderens, she's back to the gruelingly long kitchen days, the tedium of perfection, and focusing on skill in a kitchen that seems to lack real passion. From all of this, Shockey seems to have decided that in professional cooking, there is not time for enjoying the food or for sharing it with your loved ones, friends, and family. To be honest, Shockey's revelation is one that I've long suspected -- at least for certain personality types (like my own). It is different to cook for friends. I would imagine cooking professionally would be incredibly hard and stressful and just not the right fit for someone who really cooks for pleasure and enjoyment. And like any other job, if you are one of those people who loves to cook for fun, imagine how much fun it would be to return home and start doing what you do at work. Shockey also points out that the professional restaurant biz is not a great one for relationships either. Having never worked beyond wait staff at a minimally busy country club, the actual kitchen environment is one that I have zero experience with. And I don't think I ever will. I like cooking for friends and family. I love trying new things. I just don't think that I could do it day in and day out as a job -- worst would be the criticism from the public. At least your friends are always going to pretend to like what you put before them! I'll leave it to people like Shockey to experience it and then tell me all about it in their books. Sophie Littlefield is everywhere these days! She's got the Stella Hardesty series, which I've heard nothing but good things about, the Aftertime series, a futuristic dystopian series with zombies (yay! ), and her YA books, Banished and the forthcoming Unforsaken. A little bit of something for everyone! I actually read Banished last year when it was released in hardcover, but the paperback has just hit shelves (9/13) so it seems timely to do a post (my original review is in the Bookbitch archives). For Hailey Tarbell, getting away is something she dreams about. She's shunned in school and her grandmother is a dealer who shows little to no interest and certainly no affection towards her. An accident in school leads Hailey to discover that she has the unique ability to heal, but even that doesn't win her any points. In fact, it only makes things worse when a couple of strange men start following her around. Then, an aunt she's never met arrives and promises to take Hailey away. Is she really the savior she seems to be? And why has Hailey never met her before now? Before Hailey can consider her options, it becomes clear that she has to get out of Gypsum. But there are those who would keep Hailey from leaving at any cost. This one ended with a bit of a cliffhanger and many unanswered questions. Littlefield does touch on the Tarbell's history, the Banished, and their powers, and what is revealed is awesome as a backstory. I wanted more! I'm not actually certain how many books are projected to be in the series, but I'm expecting Unforsaken to cover some of these things in more detail. I know many a reader will be itching for the follow up when they turn the final pages on Banished. Banished is out now in paperback and Unforsaken is set to hit shelves October 11. Brr. It's cloudy and ick here today and the weather forecast says that's not going to change for the next few days. I'd actually welcome it if we weren't in store for a whole winter in a few months. I've got some soup recipes to try out and have broken out the tea stash this week. You should know, the creator of Luther is UK author Neil Cross. If, perchance, you become as obsessed with the series as I have, Cross has penned a prequel novel for the series, Luther: The Calling. It's a UK release, but, as always, there are plenty of places you can order it. If you haven't been to the movies lately, you've missed out on some fun ones. I hit up the theater for Don't Be Afraid of the Dark last weekend and thought it was super good. Course Guillermo del Toro could probably do no wrong in my eyes. I've loved all of his films to date. Some new adaptations are hitting the big screen as well: Drive based on the book by James Sallis, I Don't Know How She Does It based on the book by Allison Pearson, and the remake of Sam Peckinpah's Straw Dogs, which is based on The Siege of Trencher's Farm by Gordon Williams. I'm on the fence about seeing this one. The original starred Dustin Hoffman and I once caught the very end of it on tv. It's a brutally violent movie, which admittedly doesn't completely turn me off. I'm afraid curiosity might be my motivating factor in seeing it, though. For True Blood fans, it's your chance to see Alexander Skarsgard in a new role. The Big Year based on the book by Mark Obmascik comes out in October as does The Rum Diary based on Hunter S. Thompson's book of the same name (having read some of Thompson's work, I have to say this looks hilarious and I'm tempted to buy the book -- if we don't already have it somewhere). The Hugo Cabret adaptation hist screens in November. We Need to Talk About Kevin based on Lionel Shriver's book is coming in December. Then there's the remake of Tinker, Tailor, Soldier, Spy by John Le Carre the same month (and looks AMAZING). And of course, the holiday releases are the animated Tintin movie and the US remake of The Girl With the Dragon Tattoo. Other upcoming adaptations: Jonathan Safran Foer's Extremely Loud and Incredibly Close (starring Tom Hanks, so I'll be seeing it even if I don't ever read it), We Bought a Zoo, starring Matt Damon (Benjamin Mee's memoir), and One For the Money in January. But if you're not a fan of adaptations, there's still plenty coming out. Personally, I'm looking forward to Dream House, The Thing (yes, it's a reboot), Texas Killing Fields, and In Time, amongst others. And the weekend comes to an end once again. Yesterday was loads of fun. Mildly sick. My friend laughed at me for saying that, but I wasn't completely bedridden or anything, just really worn out. In fact, I used up a lot of energy putting together home made pizza dough only to have it fail. Took a lot out of me and had to order in the end anyway. Blech. Today's somewhat better. Still have a headache, still on Sudafed, still a little tired. Muddling through, though. It was a slow reading weekend, too. Technically I finished one book (but I'd started it around the middle of the week, so... yeah). I also made it through most of Darynda Jones's latest (yay!) before passing out last night. Just a tiny bit to finish up today and I can't wait to dive back in. When we last left Charley Davidson in First Grave on the Right, she'd discovered Reyes's true identity and then he up and disappeared! Second Grave on the Left picks up just a few days later when Cookie's friend goes missing, leaving behind a strange message in a bathroom stall. Charley also finds a dead man in Cookie's trunk and receives some very unwelcome visitors of the living sort. Add to that the fact that Reyes has revealed that he is holed up somewhere, mortally wounded and considering leaving his corporeal body behind, which could lead to disastrous results. Charley's life is certainly never dull! I mentioned it before, but Charley is one super fun heroine! I love Darynda Jones's sarcastic sense of humor and I think she does a great job of blending mystery and paranormal in the series. Book three, Third Grave Dead Ahead, is set for release early next year. Holiday weekends are funny things. Like regular weekends, I have plans -- things to get done that can't get done during the week -- but mostly, I like the time away from the responsibility and demands of weekdays. There are no schedules to keep and usually nothing too pressing that needs to be addressed immediately. I like to relax and I love the extra time a holiday weekends allows for that! And that's pretty much what we did this weekend: cooked some good food, saw a couple of movies, caught up on Doctor Who and The Hour, and read. With Lisa Unger's Fragile fresh on my mind and her latest, Darkness, My Old Friend newly out in hardcover just last month, I decided a return to The Hollows was in order. The two books work as companions and each stands alone, but Darkness does take place just a few months after Fragile. After recent events prompted Jones Cooper's retirement, he's found himself with a lot of time on his hands. He's taken to watching the neighbors' houses when they are away, watering plants, feeding pets, and the odd job here and there. A visit from a local psychic kicks off his involvement in a local PI's case reinvestigating a disappearance that occurred early on in Jones's career. Marla Holt left behind her husband and two small children and was never heard from again. Now, Michael Holt is grown and wants to know what happened to his mother. Meanwhile, a local wife has hired Jones to find her stepson's mother. But there's more to that missing person's case than immediately meets the eye. I loved Unger's setup of The Hollows. It's a fictional town in New York that she's built from the ground up. She's filled it with her own people, places, things, geography, and other characteristics, bringing it to life in a way that enriches the stories. I really can't recommend Unger highly enough for mystery/thriller fans. Standard thriller terms like, page-turner, gripping, and up all night definitely apply to each of her books I've had the pleasure of reading so far. Fun stuff! Hi, everyone! Hope your weekend has gotten off to a great start. Just over a week until one of the fall's most anticipated books hits shelves (9/13) and it's one that I'm personally dying to get my hands on! 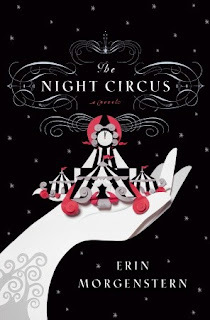 Erin Morgenstern's The Night Circus has been getting rave early reviews and I think everything about it sounds fabulous! See? Sounds fantastic! If you've had a crack at an early copy (lucky dogs! ), you'll have to let me know what you think.